I, happily, have mastered script and pen. I am blessed with high official rank. With me, luckily, there is not much wrong. But I have finished with marriage and giving in marriage. No business comes to impair the vigour of my limbs. Body and soul have rested in hermit peace. What I shall need are very few things. One meal to last me the whole day. One cannot sleep in more than one room! One cannot ride on two horses at once! Possibly one would find seven out of ten. Look as you may, you will not find one. In their own business even sages err. To no one else would I dare to speak my heart. So my wild words are addressed to my nephews and nieces. 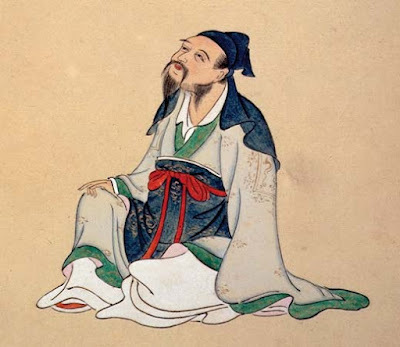 This poem was written in 835AD when the great Chinese poet Po Chu-i was in his late sixties. In Imperial China everybody who could read and write tried to get into the civil service. Those who succeeded were guaranteed a job for the rest of their working days and a substantial pension at the end of them. This is a lovely poem about contentment in life (As fortunate as me among the people of the world/ Possibly one would find seven out of ten./As contented as me among a hundred men/Look as you may, you will not find one). Since there is an element of boastfulness in what he says, it may not all be literally true in the factual sense. But the poet is certainly right in asserting that contentment is the principal ingredient in every happy state.